The investigation began when the FBI noticed last fall that Jameson was posting "Like" and "Love" notices on Facebook posts that were pro-Isis. A Lafayette man visiting Barcelona, Spain was confirmed killed in a terrorist attack Thursday in the Catalonia city. 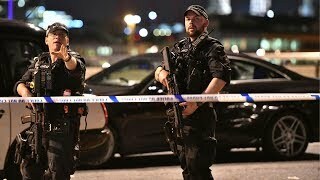 Armed British police rushed to London Bridge late Saturday after reports of a vehicle running down pedestrians and people being stabbed nearby. The widow of a shooter who killed 49 people in a Florida nightclub last year has agreed to be transferred to Orlando, Fla.
Three University of California at Berkeley students were injured and one remains missing after an attack Thursday night in Nice, France. Presidential candidate and former Secretary of State Hillary Clinton will make an appearance Wednesday morning at Stanford University. San Francisco police have deployed extra officers at San Francisco International Airport and Muni stations. Mourners lit candles outside the French Consulate to honor the memory of those slain in Paris. SAN FRANCISCO — Hundreds gathered Wednesday evening in honor of the 12 people murdered Wednesday in an apparent terrorist attack in Paris. The FBI said Friday a 2013 attack on a Silicon Valley power station was "100 percent" not terrorism. Crowdsourcing helped the FBI gather images of the Boston incident, but would-be online sleuths had more misses than hits. Last May, Osama Bin Laden was killed. Last month, his severed head was eaten in San Francisco.